First off, I apologise for the lack of reviews lately; NaNoWriMo has been consuming most of my post-work hours, leaving me little time either to read or to compose reviews. In Volume 4 of the Sandman graphic novel series, the focus is initially — and for the first time — on the family. That is, on the Endless, on their interactions with each other. Though we’ve seen some of them before — and though one, known here only as the Prodigal, is still missing from the count — this is the first time we get explicit descriptions of each and his or her duties. Destiny calls a meeting, because it is destined that he will. Desire picks a fight, which leads to Dream deciding that he needs to go free Nada (remember her?) from Hell, even though it may cost him his own existence. Why do they blame me for all their little failings? They use my name as if I spent my entire days sitting on their shoulders, forcing them to commits acts they would otherwise find repulsive. “The devil made me do it.” I have never made one of them do anything. Never. They live their own tiny lives. I do not live their lives for them. And then they die, and they come here (having transgressed against what they believed to be right), and expect us to fulfill their desire for pain and retribution. I don’t make them come here. They talk of me going like a fishwife come market day, never stopping to ask themselves why. I need no souls. And how can anyone own a soul? No. They belong to themselves…. They just hate to have to face up to it. After chivvying out the last few stubborn souls (including Breschau, and when Lucifer tells him, “No one cares any more, Breschau. No one remembers. I doubt one mortal in a hundred thousand could even point to where Livonia used to be, on a map”, I would just like to point out that I am that one in a hundred thousand. I mean, maybe not precisely, but it was a Baltic state, somewhere in the Latvia-Estonia region) and recalcitrant demons, and having Morpheus cut off his wings, Lucifer locks up — and throws Morpheus the key. He makes Morpheus custodian of what he calls “the most desirable plot of psychic real estate in the whole order of created things” — and he proves right, for claimants waste no time in coming a-calling. Representatives from many different pantheons show up: Odin, Thor, and Loki for the Norse, looking for a way to avoid Ragnarok; Anubis, Bes, and Bast for the Egyptian; three demons displaced from Hell, led by Azazel, who offers to trade, giving Morpheus Nada as well as another demon who had offended Morpheus in the past in exchange for the return of their property; Susano-o-no-Mikato for Shintoism; manifestations of Order and Chaos; two angels, Duma and Remiel, from the Silver City, there, Remiel claims, simply to observe; and Cluracan and Nuala of the Faerie, asking that Hell be left empty, so that they will no longer have to pay their tithe. Morpheus tells them that he will hear each delegation in turn, and then make his decision. Ultimately, Morpheus decides to remit Hell to its original creator, and hands the key over to Duma and Remiel; the damned return, and things go on much as usual — except that now, under the direction of the angels, the overtones are now of purifying, not punishment, because they love the souls they now have charge of — which, as the damned note, makes it so much worse. But that doesn’t settle issues for Dream. He still has to contend with the demon Azazel, who threatens to destroy Nada in revenge for Morpheus’s decision. But in the Dreamland, Morpheus has supreme power, and he defeats Azazel and sets Nada free. They have an appropriately anticlimactic conversation — what do you say to an old lover, ten thousand years later? — and Nada decides that she would like to forget all and live again. Morpheus grants her request, causing her to be reborn in the body of a Chinese boy. Still in the Dreamland, Loki tricks Susano-o-no-Mikato into taking his place in his own personal hell; when Morpheus learns of this, he frees the Shinto god, but agrees to let Loki remain free as well, putting an illusion in his place, with the understanding that Loki is now in his debt. Finally, Morpheus finds himself saddled with an unexpected burden: Nuala, who had been offered up as a gift by the Faery Queen, and who cannot now return home without causing offense. Dream agrees to let her stay, but strips her of her glamour, revealing not the beautiful, haughty blonde, but a small, pointy-eared, mousy-haired girl. The collection wraps up with Lucifer on an Australian beach, discussing the sunset with a local man. There’s an odd poetry to this volume. Perhaps appropriately for a story featuring Lucifer Morningstar, there’s an almost Romantic sensibility to the language — which is often entirely at odds with the grotesque and gruesome artwork. Lucifer both is and is not the Byronic hero; appropriately for the original rebel, he refuses to conform to anyone’s expectations. He is, perfectly, a nonconformist, refusing even to adhere to the usual picture of nonconformity that latter ages have painted for him. That sense of the language fitting the character and situation continues through the rest of the issues, down to the lettering for the speech bubbles of each of the various visiting pantheons. Gaiman gives each of them a unique voice — whether tangentially polite, like Susano-o-no-Mikato, thunderingly direct, like Thor, floridly gracious, like Cluracan, or purringly sensual, like Bast. No one representative actually gets that much stage time, but you still finish the volume feeling certain you know who these individuals are — both within the confines of their mythos, and out of it, in the less-cleanly-cut world of Sandman. The only real off-note for me in this collection is the side story taking place at the boarding school, when the closing of Hell apparently means that the dead start coming back. I just find it rather dull, and don’t think it really adds anything. Overall, this is a great story, and it sets up so much for the rest of the series. So many characters will return, so many deals struck or rejected will become important again, and so many things hinted at will be revealed in full later on. The Season of Mists opens up the universe to a larger expanse, and we also see more of Morpheus ruling his realm. The Dreamland gets some more rules and structures — not to mention new inhabitants. 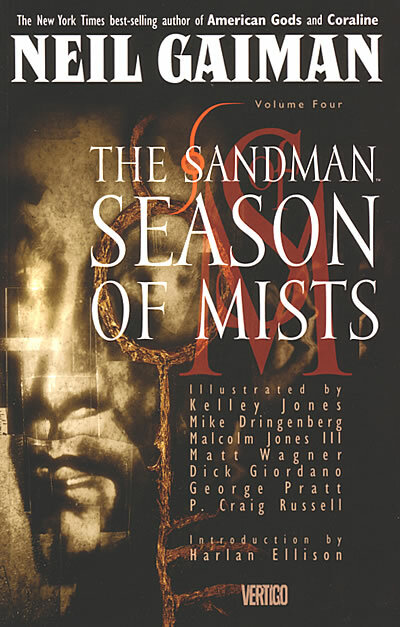 The Season of Mists is a great, strong installment in the series, a detailed and well-crafted exploration of the mythos of Gaiman’s universe.